Canadian Prime Minister Justin Trudeau speaks at an event. Trudeau talked about President Donald Trump and the future of the North American Free Trade Agreement deal. CHICAGO — Canadian Prime Minister Justin Trudeau discussed President Donald Trump’s leadership style and the state of international trade at a University of Chicago event Wednesday. The event was hosted by the Institute of Politics at UChicago, which brought Trudeau to campus to speak for its five-year anniversary. 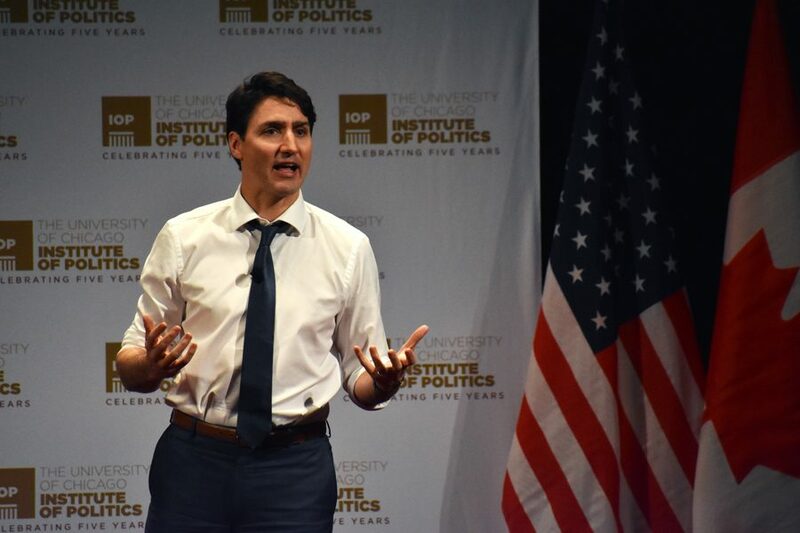 Trudeau shared his views on the relationship between the United States and Canada and had a conversation with Institute of Politics founder and director David Axelrod, a former senior advisor to former President Barack Obama. Trudeau noted the social, cultural and economic interconnectedness between the U.S. and its neighbors to the north. “There is no other country in the world that has a greater vested interest in the United States being successful than Canada, because not matter how good we are doing in Canada … when you sneeze, we catch a cold,” Trudeau said. The two discussed Trump’s effect on foreign relations and North American Free Trade Agreement negotiations. Trudeau said he would rather not have a NAFTA deal than have a deal that doesn’t benefit Canada. Axelrod noted Trump ran his presidential campaign on an anti-trade agenda. Despite the common language and economic interests Trudeau pointed to, Axelrod pressed the Prime Minister to discuss the disruptions Trump’s presidency has created in Canada. Axelrod mentioned a recent poll that measured Canadians’ approval of the American leadership at 20 percent. “Our countries and our peoples get along so well and are so closely intertwined that the relationship is much bigger and much deeper than the ideologies or the perspectives of whoever happens to be Prime Minister of Canada and whoever is occupying the White House,” Trudeau said. Trudeau also acknowledged that while Canadians are actively engaged in American politics, people from the U.S. know less about their neighbors to the north. Caroline Hutton, a public policy major at UChicago, introduced Trudeau and pointed to the similarities between the United States and Canada. She said both countries are committed to democracy and human rights and that Canada has provided a “model” for these values. She said Trudeau’s early career as a teacher displayed his “dedication and belief in Canada’s young people” before he entered politics. “Prime Minister Trudeau sets an extraordinary example of the power in public service, in progressivism and in young people,” Hutton said. Trudeau, Canada’s second-youngest prime minister in its history, encouraged students to get involved with politics and to not become jaded into thinking they don’t play a significant role in shaping policy. Trudeau said many young people today focus less on the partisan aspect on politics and more on the “substance” of the policies. “We as a world right now … have an awful lot to learn from you, from your approach, from your dynamism, but also your willingness to challenge the way things have always been done,” Trudeau said.